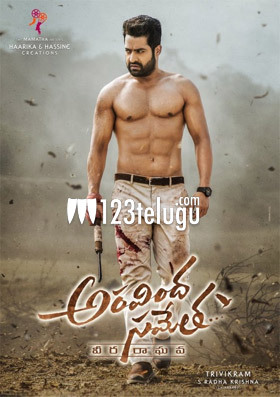 NTR and Trivikram Srinivas’ ongoing action entertainer, Aravindha Sametha, is one of the most eagerly awaited movies which will be hitting the screens during the upcoming Dussehra festive season. The film’s team has wrapped up nearly 70 per cent of shoot so far. Aravindha Sametha was shot at Bheemanapally and Kanumukala villages in the Bhoodan Pochampally mandal of Yadadri Bhuvanagiri village in Telangana yesterday. Pooja Hegde and comedian turned hero Sunil took part in the shoot. A couple of scenes where Pooja and Sunil interviewing villagers and offering special prayers at a temple were shot in the two villages. Jagapathi Babu and Naga Babu play key roles in Aravinda Sametha. Thaman is the film’s music composer and S Radhakrishna is the producer. Stay tuned for more updates on this highly-anticipated biggie.